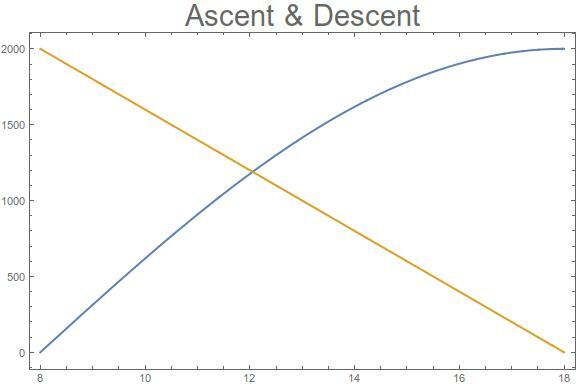 It is clear that the two curves must intersect at some point, making the altitude equal at that time on both days. This equality of altitudes is a simple consequence of Brouwer’s fixed-point theorem. The fixed-point theorem is one of the fundamental results in algebraic topology, named after Luitzen Brouwer who proved it in 1912. Fixed-point theorems (FPTs) give conditions under which a function f ( x ) has a point such that f ( x ) = x. FPTs are useful in numerous areas of mathematics. Brouwer’s result is one of the most important of them. In the plane, Brouwer’s theorem means that every continuous function from a closed disk to itself has at least one fixed point. In Euclidean spaces of higher dimensions, a continuous mapping of a closed ball info itself has a fixed point (or more than one). More generally, the theorem is true for any convex compact set in Euclidean space and even for such a set in an infinite dimensional Banach space. For an example in two dimensions, suppose you are in New York, and spread out a map of the city. There is always a point that can truthfully be labelled “You are here”. This is the point on the map corresponding to your current location. Another example in two dimensions: suppose you rake the gravel in your yard. There should be at least one piece of gravel in the same place where it was before you started (unless there is a flower-bed in the centre of the yard!). Similarly, in three dimensions, if you stir a jug of lemonade, at least one fluid particle must return to its starting point. More generally, Brouwer’s theorem ensures that, for any function f ( x ) mapping a convex compact subset K of Euclidean space to itself, there is a point x0 such that f ( x0 ) = x0. The simplest example is for a continuous function from a closed interval I on the real line to itself. The great Hungarian mathematician Paul Erdős defined a mathematician as a machine for turning coffee into theorems. It is said that Brouwer was intrigued while watching the surface of his coffee as he stirred it: he noticed that there is always one point on the surface that is not moving. This inspired him to prove his FPT. Left: Luitzen Brouwer. 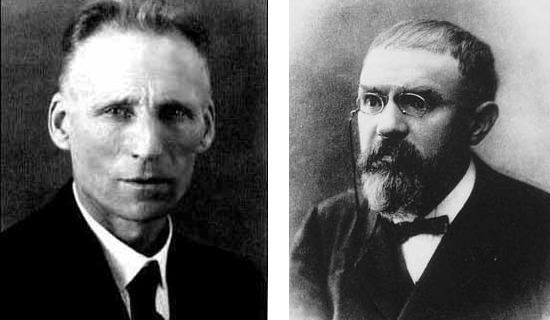 Right: Henri Poincare. Algebraic topology arose out of Poincare’s study of differential equations. He was studying the stability of the solar system and found that new mathematical methods were required. By the 1930s, his “analysis situs” had evolved into algebraic topology. Brouwer’s FPT is also useful in game theory and in economics. One curious result of the theorem is that, in the game of Hex, there is always a winner. Players alternately mark hexagons on a board, trying to build a continuous path from one side to the opposite one. If one player achieves this, the other one cannot break through: there cannot be a draw. Brouwer’s FPT is intimately connteted with the Hairy Ball Theorem, which he proved in 1912. This implies, in particular, that a continuous vector field on a sphere must have a zero at some point. Regarding the global wind as a vector field, it means that there is at least one point where conditions are calm; the wind cannot be blowing everywhere at the same time. Another FPT is that of Stefan Banach, proved in 1922. In technical terms, this states that a contraction mapping on a complete metric space has a unique fixed point. For a contraction, the images of any two points are closer together than the points themselves; the mapping has a shrinking effect everywhere. The first general definition of the dimension of a set was formulated by Brouwer in 1910. He showed that topology has the power to distinguish between sets with different dimensions. This may seem trivial, but recall that Georg Cantor had shown, a few decades earlier, that a line and a plane have “the same number of points”: there is a one-to-one mapping between them. But topology can help: remove a point from a line and it breaks in two; no such fracture is suffered by a punctured plane. Brouwer defined the topological dimension in an inductive way. His definition of the dimension was followed by several other formulations, all requiring the dimension to be a whole number. Of course, this requirement was relaxed by Mandelbrot when he formalised the concept of a fractals, sets with fractional dimensions.